The Monk is a melee fighter, with an emphasis on speed, combos, aura bonuses, and tactics, rather than the brute force of the Barbarian. Many of the Monk's skills have an Eastern martial arts influence, while his appearance is a mixture of European medieval monks with saffron robes and fashions drawing from the Eastern, Shao Lin style influence. 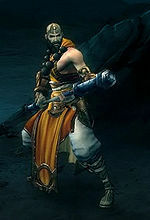 The Monk was the fourth playable class revealed for Diablo III and was announced in October 2009 at Blizzcon. The male Monk character comes from the Monasteries of Ivgorod in the Foothills. They are taken into the Monastery at a young age, where they are taught ancient knowledge; they believe in 1001 gods that dwell within everything (one god in water, one god in fire, one god in the air, etc. ), martial arts, and meditation to purify the body and soul. The Monks have a fondness for structure and creativity, which is why they have various symbols on their bodies. Their light magic is brought to life through runes, symbols that invoke the light to aid them. It is said that each Monk has a tattoo on his back, that chronicles their lifetime/adventures (needs confirmation), and that it may take a monk an entire lifetime to complete the tattoo on his back. The monk serves the Elder Monks of the monastery, who seek to destroy evil in all forms. He thinks of himself as the weapon of the gods against all that is evil. He is a peaceful, patient and good man who aids those who suffer, with no hatred against anyone, in contrast to the Barbarian. He is adept in Martial Arts, being able to defeat multiple foes without the aid of weapons. Leonard Boyarsky, Diablo 3's lead story designer, discussed this in an August 2009 interview. (The Monk) comes from a place called Ivgorod, you know when we started looking at a story about a monk we didn't want to just have what would be considered the standard monk. At Blizzard we love to put a little twist on things and do things a little bit differently. So we thought it would be interesting to take some kind of 13th century... well not factual, but some kind of Eastern European 13th century monk and combine it with the more Eastern style; not only in terms of the look but also in terms of the philosophical. So he has the Eastern philosophy integrated into him, the movement has a lot to do with life and the gods mixed in with a very theocratic, organised religious belief system. But he's very devout, he's fighting the good fight; he's a holy warrior. He's very straight-ahead in what he does, there's no gray area for him and it's not that he's inflexible -- he does what he thinks is right. If he has to meditate on that for two days he'll do it because he's got to do the right thing - his fighting is his way of worshiping. That's how we approached him, which gives him a very different feel. The Barbarian has a good mythology; we gave the Witch Doctor a very rich mythology. In the game they have a very different experience as different characters, but also, possibly come into conflict with each other because of their different belief systems. The Monk's skills were first revealed at BlizzCon 2009, when only 8 of them were in the game, assigned randomly to three skill trees. The entire skill tree system was reworked during 2010, and at BlizzCon 2010 the Monk's skills were seen again, in a very different form, with all passive skills moved to traits. However, At the July 2011 Press Event, it was revealed that traits had been changed back to passive skills. The Monk skills can be divided into three categories: Combos, Auras, and Spirit Skills. Combos are three-stage melee attacks with a wide variety of types and effects, dealing damage plus buffs, debuffs, and more. Combo skills generate Spirit, the Monk's resource, which must be expended to cast his Auras and other skills. Auras are skills that provide a lasting bonus to the Monk and often to his allies, or that debuff enemies. They are cast to activate them, then persist for some duration. Spirit skills are all the rest. They cost spirit to cast, and provide a variety of direct attacks, defensive bonuses, or other varied properties. The following is a very quick list. See the Monk skills page for a more thorough summary, or any of the individual skills pages for full information. Fists of Thunder - This combo skill unleashes a series of lightning infused punches that deal bonus weapon damage as lightning damage, and have an increased chance to interrupt enemy attacks. Deadly Reach - This combo skill projects lines of pure force over a short distance. Crippling Wave - This combo skill provides a series of large sweeping attacks that damage and debilitate enemies. Sweeping Wind - This combo skill causes the Monk to sweep his weapon in a wide circle, forming a barrier of force that deals damage to every enemy hit. Can hit enemies multiple times. Way of the Hundred Fists - This combo skill sends the Monk dashing to deal multiple hits to any number of targets in his range. Blinding Flash - Creates a flash of light that blinds all nearby enemies for a short duration. Blinded enemies will not attack unless they are attacked first, and also suffer a reduced chance to hit. Lashing Tail Kick - The Monk unleashes a deadly roundhouse kick, causing knockback and bonus damage. Breath of Heaven - The Monk banishes any harmful effects from himself and his allies, including stun, slowing, and effects that reduce defensive or offensive abilities. Dashing Strike - This combo skill allows the Monk to dash quickly at the targeted enemy or location, dealing weapon damage and bonus physical damage when he arrives. Lethal Decoy - The Monk creates an illusion of himself composed of pure holy energy. This illusion attracts enemies to it, before exploding, dealing holy damage. Inner Sanctuary - Creates a protected region on the ground for a short duration, shielding the monk from melee attackers. Exploding Palm - Marks a single enemy and causes a bleeding effect. If an enemy dies while the mark is in place they detonate in a blood supernova, dealing heavy damage to anything in the vicinity. Tempest Rush - Run directly through your enemies knocking them back and hobbling them. Serenity - The Monk creates a shield that protects him from all incoming damage for a short duration. Seven Sided Strike - A powerful attack that allows the Monk to teleport to a target, then strike it or something nearby multiple times. Mystic Ally - Summon an elemental ally capable of engaging enemies in combat. Wave of Light - The Monk summons a rolling wave of light that crushes everything in its path, dealing holy damage. Mantra of Evasion - Recite a Mantra that increases the dodge chance of you and your allies. Mantra of Retribution - Recite a Mantra that causes you and your allies to reflect melee damage back at enemies. Mantra of Healing - Recite a Mantra that increases the Life regeneration of you and all allies. Mantra of Conviction - Recite a Mantra that causes enemies to take additional damage. This is a very quick listing. See the Monk skills article for more details, or click on any of the individual passive skills for full stats and info. Exalted Soul - Increases maximum Spirit. Frenzied Attacks - Increases the chance to deal critical strikes and increases critical strike damage when the character is wielding two weapons. Superior Skill - Increases precision. Expert Defense - Increases defense. Resonance - Increases the duration of Auras. Untouchable - Increases dodge chance after dealing a critical strike. Counterattack - When the Monk dodges an attack, the next skill has its Spirit cost reduced. Weak Spot - Increases critical strike damage. Strength in Adversity - Healing effects are improved if the Monk is low on health. Near Death Experience - When the Monk receives a near-fatal blow, the Monk gains health and Spirit. Flawless Technique - Skills that generate Spirit (Combos) do more damage. Strength of Spirit - Skills that require Spirit do more damage. Many traits were preserved as passive skills, but a lot them were dropped. See the Monk traits page for full info on what the traits system looked like. The "theme" of the Society of Monks is a mix of "spiritual" Buddhism and "eradication of evil" of the European churches while maintaining an Asian/Indian visual theme. Abd al-Hazir writes about an encounter with a Monk in a tavern, in his 32nd entry of the Writings of Abd al-Hazir. 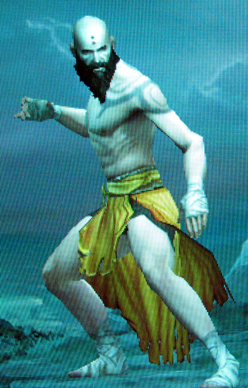 The monk was partly made as an opposite to the Barbarian, with more focused gameplay. He is also relatively weak, so a lot of the class design is built upon the monk debuffing his foes, to receive less damage himself. For the Monk, we really were inspired by fighting game characters and games like God of War, where we wanted a character that could do really cool moves in rapid succession. So, we decided to do a combo system for him where many of his combat skills have different stages to them so as you use them, you move from stage 1 to stage 2 to stage 3. You can mix and match abilities as well and put them together. Female monk silhouette on the right. The Monk debuted at Blizzcon 2009 with just the male version playable, and represented in artwork. There was no sign of the female monk at that point, not in the game or in concept art, though it was always understood that there would be a female version. Jokes flew about her being called "the nun," but no hints were given as to how she'd compare to the male, with his prominent bald head. It wasn't until afterwards that fans realized the silhouette in the character creation screen was in fact taken from a piece of female monk concept art. That artwork has never been seen; the female Monk was redesigned after Blizzcon 2009 but before the reveal in February 2010, losing the long hair for a "pixie cut." None of the concepts of earlier versions of the character design have yet been released. 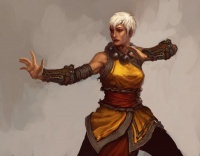 The official version of the female monk finally reared her head on February 5, 2010, when concept art for the character was seen in an episode of the Jace Hall Show. High quality versions of that artwork were released the next week, and after some fairly intense debate, the official art was widely approved. For instance, fansite Diablo.IncGamers.com ran two votes; one to pick the best of the fan art, and then a second with the top 3 pieces of fan art against the official version. The official version won handily. The female Monk gained more visual recognition thanks to the efforts of a fan. A cosplayer at BlizzCon 2010, Christina Estrada, wore an amazingly-realistic female Monk costume and won first prize. She's since gone on to appear in that costume at other game conventions as a paid presenter, and it's quite possible that more fans have seen her rendition of the outfit than any of the official game artwork. Way of the Hundred Fists in action. The Monk's concept was that of a fighting game character, where the player could create combos by pressing the right buttons at the right time. This system evolved into the Monk's combos, all of which have three stages, though there's no real skill required to trigger them in sequence. Using a skill will cast the first stage of that skill. The player has a 0.6 second window to press the skill again to advance to the next stage of that (or a different) skill, that may lead to the 3rd stage of said skill. Alternatively, the player can wait for the 0.6 second window to pass, to re-use the first stage of the skill. Use/Objective of Skill(s): Easy for Beginners, Depth for veterans. Stage One: Way of the Hundred Fists, move in close to the enemies. Stage Two: Crippling Wave, lower the damage of the enemies. So you think it'll be inviting to brand new players as well as experienced players? Because it seems like it could make him more challenging for people who, you know, aren't used to the game. Julian: Yeah, there is an intent that he will be a little bit more challenging, that he is a little bit more for the not-beginner user. That doesn't mean you won't be able to jump right in with him and still be successful. I think that the intent here is that there is just enough of a learning curve that people who want to master that character have some place to go with that idea and become really good at it. ...But somebody who's more of a master might really follow the intricacies of how to combo multiple skills together, so something that they might do might be rather than just clicking away and having fun with that, they might be doing things like where they rush in, hit a combo that sort of stuns monsters, position themselves in the middle of that pack, then let off the big [[AoE]] [Area of Effect attack]; they're a little more efficient with their moves and maybe taking a little bit less damage as a result of it. During the BlizzCon 2009 Diablo 3 Heroes and Monsters panel, it was said that the combat style was influenced by the combat styles of the Assassin in Diablo 2: Lord of Destruction and the | Rogue class in World of Warcraft. Though the Monk can use most types of melee weapons, he has two specialties; Fist weapons and combat staves. The Monk was fairly-limited in his weapon options in early development, though his allowed weapons increased over time. Here's a quote about his early days, from a Blizzcon 2009 interview with Kevin Martens and Leonard Boyarsky. The Monk has a very limited weapon set. In the demo, nearly every weapon the Monk picked up had a big red X on it because he can't use it. Is that how he will be in the final game? Leonard: Not quite as limited as it is now but yeah. Joystiq.com: Right now the staff he comes with is the only thing I've been able to use. Leonard: He's got fist weapons too, like fist knives, pretty cool-looking stuff. Kevin: But it's just not all done yet. So we wanted to make sure what we did have on the demo is of the same quality as the other classes. We had to limit that. Leonard: And the difference between him and the other characters is that his stuff will probably take a lot longer to percolate into the game because his skills are very much based on his weapon choices, kind of like how the Assassin in D2 was very much defined by her weaponry. That's kind of how he is. When he has a staff, he has a lot of skills available to him. If you've picked them and bought them I guess, they're very sweeping. Whereas if he has fist weapons, his skills are based on quick hits and stuff. So that's kind of the way we're going with him. So as you can imagine, it's not as easy as just putting a sword in a character's hand that disappears when he does all his skills and stuff. With the caveat, of course, that if we decide that's not the way we're going to go, we're going to give him 20 weapons, you know. 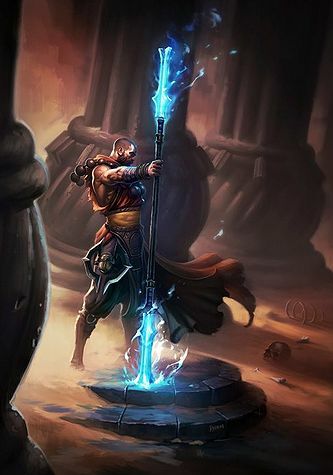 The Monk has a staff and the fist weapons. Will he have any weapon specific skills? Like dual wielding with just the fist weapons? Jay Wilson: We're talking about that. One of the things we’ve talked about with the Monk is that a lot of his skills don’t really use his weapons. So he’s doing melee skills with his weapons almost holstered. For instance, Debilitating ... I think it’s called Crippling Wave now. We change them a lot and I get mixed up on the titles. Anyway, the Crippling Wave skill seems like it should be a staff skill. It’s kind of AoE, he does it and affects a lot of guys around him. So it’s a possibility that we’ll do skills and redefine them based on combat styles and have those styles have a weapon preference. During early development, the Monk was quite limited in the weapon types he could equip. This changed later on, and as of the beta test, the Monk can use every type of weapon other than the few that are class-specific to the other character classes. Unfortunately, due to his earlier weapon selectivity, there are not animations in the game for the Monk to wield most weapons, and as a result he holds weapons at all times, except when he goes into combat when he performs most attacks with his fists (or with a staff, should one be equipped), while his equipped weapons are slung over his back. This fairly silly state of affairs is unlikely to be rectified before the game's launch, but it seems likely the developers will add in additional proper Monk animations at some point after release, when the artists and animators have time to catch the visuals up to the actions. The following lists some of the Blue statements from earlier in development, explaining why the Monk could not use various types of weapons. Currently our list of weapons the monk class can use is one handed swords, polearms, combat staves, and fist weapons. That could potentially change, but its probably pretty likely those will be the weapons the monk can equip. The flavor of the monk we’re working on now is a very strong connection between a small and focused group of weapon types, and the skills that use them. Bashiok from April 2010, when Monks could not use shields. Bruce Lee would not use a shield, and neither would the monk. As numerous fans pointed out at the time, Bruce Lee was not a monk, nor was he battling for his life against giant demons covered in razor sharp spikes. This logic cut no ice with Bashiok, but obviously the developers had second thoughts, since the Monk was seen using a shield in the August 2010 Artisan Video. A level 1, "naked" Monk. Diii.net: A question from our forums; can the monk use heavy plate mail and still do all of his high motion combo attacks? Jay Wilson: Well we do different versions of armor for every character. The Diablo II Sorceress could use heavy plate mail without actually looking like she was covered in heavy plate mail. For us, our focus is to make sure that every character has armor that they look cool in. So the Monk’s armor isn’t going to look like heavy plate armor. It’s going to look like a shirt, what our imagination of what the Monk’s armor could be. It’s definitely going to be equipment, but he’s not going to look like he’s covered in metal, like the barb is likely to look. Diii.net: One other question on the Monk’s armor. Traditionally in RPGs, Monks have bonuses to light armor and penalties to heavy armor. Is that something you guys are looking at? Jay Wilson: No. We’re an item based game. The idea of a character that doesn’t use items is foreign to our basic game philosophy. So one of the things we decided when we were creating the Monk was that we were not going to explore that aspect of the character. We’re going to make a Diablo Monk, and the Diablo Monk uses items. The D3 Team has thus far only revealed bits and pieces of the Monk's story and lore. They are said to be holy and pure, "lawful/good" to use the D&D terminology. They have a vivid cosmology with 1001 gods, and some of their skills will be directly inspired by one or more of these deities. The first information we received about the Monk came from lead story designer Leonard Boyarsky at the Blizzcon 2009 Character Panel. They're really religious holy men, they are raised from childhood in secluded monasteries where they are taught to be pure expressions of their deities through perfection of their fighting techniques. They have 1001 gods and they go so far as to tattoo a symbolic representation of them all over their backs, it's this intricate design and it takes their whole life to complete... When they're not fighting they're training to fight, they spend their time in deep meditation to cleanse sin from themselves... They're equally feared and respected, even by their own citizens, because they are a little bit - you know, they dedicate their whole lives to this. The guy who dedicates his whole life to fighting in the service of God is not a guy you want to see coming down the street for you. The Monk's background was related in the 32nd journal entry of Abd al-Hazir. The last weeks of autumn had settled upon Ivgorod, and the first breath of winter had crept into the air. As night fell and the sun dipped below the horizon, I was all too grateful to take refuge in a tavern. As I entered, I noted a certain tension in the room. Despite the hour, it was not busy, with only scattered, small groups huddled at the tables around the edges of the room. The benches at the center of the room were empty except for one man. The man seemed ignorant of the cold. He was dressed like a beggar, wearing little more than an orange sheet wound around his body, leaving half of his chest exposed. A garland of large wooden beads hung around his thick neck. His head was completely shaved, with the exception of a wild bushy beard. Then, recognition struck me: upon his forehead he had a tattoo of two red dots, one larger than the other. As any informed student of the peoples and cultures of this world must also realize, this man was one of the Monks of Ivgorod, the secretive and reclusive holy warriors of the country. I had heard countless fantastic stories about the monks, tales that were surely the beneficiary of significant embellishment. The monks’ skin, the accounts said, was as hard as iron, impenetrable by the blade of any sword or by the point of any arrow, and their fists could break stone as easily as you or I would snap a twig. Though the unassuming man before me seemed miles away from what I had heard and read of the monks, I approached cautiously, sliding down onto the bench across from him, eager to take his measure. He beckoned me forward with a small wave of his hand. "Ah, a soul brave enough to sit with me. Come, friend." Food was placed before me, but I had little hunger for it, focusing instead on recording the details of the monk's life. He told me of his belief in the existence of a thousand and one gods, gods he believed could be found in all things: the fire in the hearth, the water in the river and the air that we breathed. Pretty enough for a story, perhaps. But any reasoned individual must surely, as I did, scoff at such a view of the world as little more than superstition. He went on to describe his intense mental and physical training, his unending quest to hone his mind and body into an instrument of divine justice. Though I do wonder for what need his thousand gods would require a mortal man to implement their will. When I asked him why he did not carry a sword or, indeed, any weapon at all, he simply replied, "My body is my weapon." Then raising his hand and tapping his forehead, he added, "As is my mind." Most unexpectedly, I would be treated to a display of this mastery. A group of men approached our table, knocking my book to the floor and shoving me out of the way, producing knives and other weapons as they advanced. They were focused only on the solitary figure of the monk seated across from me. I scrabbled beneath the table, having an inkling of what was to come. I watched as at some unseen signal, they attacked. Without rising from his seat, the monk met the first man's lunging slash, grabbing his wrist and tossing him carelessly over his shoulder, throwing him into a table with a loud crash. The suddenness of the monk's attack momentarily stunned the men, and as they stood there, he rose. That was when chaos broke out. The monk was a fluid mass of restrained energy, meeting every attack with hardly a moment's distress. He fought with hands and feet in a way I had never seen before. In my days, I have witnessed my share of drunken bar brawls, but this was something else altogether. The sound of bones crunching with each of his strikes mixed with something I could not quite believe: the monk was laughing as he fought. One by one, he dispatched his foes until only one remained. That one picked up a chair and hurled it toward the monk. The monk swung his arm forward and struck the incoming projectile, meeting the solid oak of the chair with his closed fist. The wood broke apart, splinters filling the air as the shattered pieces of the stool fell harmlessly to the ground around him. "You don't fool me, demon," the monk spat. He pulled his arms back to his sides, then extended his hands before him and began to chant. A nimbus of white light appeared around his head, growing larger and more intense until it completely encompassed the monk’s body. He roared, and the light blew outward. As it washed over the other man, his skin peeled away, revealing a red-skinned demon beneath and threw the creature through the front doors of the tavern. The monk hurtled forward, but his individual movements were too fast for my eyes to track. It seemed as though there were seven of him raining blows upon the demon from every side. Staggered, the demon stumbled. The monk grabbed the demon by the neck, grinning as he pulled his free arm back, crackling energy glowing on his open hand. He shoved his palm forward, and when it struck the demon, its body exploded: muscle, skin and bones tore apart, and the smell of burning flesh filled the air. I would not have believed it if I had not seen it with my own two eyes. It seems the stories of these peerless warriors might not have been as exaggerated as I first thought. The Monk was the Fourth class to be revealed by Blizzard, debuting during the opening ceremony of BlizzCon 2009, in front of 26,000 cheering fans and countless DirecTV viewers. 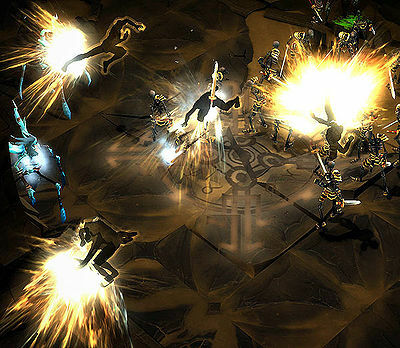 As with much of Diablo III, the D3 Team took inspiration from old Pen and Paper RPGs and from Fighting Games/Console Brawlers. The female version of the Monk was revealed on February 5th, 2010. 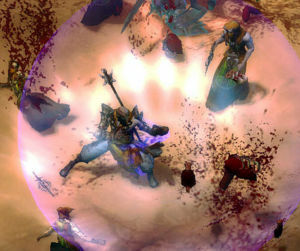 Despite the fact that the official expansion pack for Diablo, Hellfire, added a fourth character called the Monk, the D3 Team has repeatedly insisted that there is no connection between the two characters, either in design or lore. GamePlanetNZ: Diablo: Hellfire (the 1997 expansion by Synergistic Software) was obviously not a Blizzard game, but I have to ask about the Monk, because it appeared in Hellfire - did you guys look at Hellfire and draw any kind of inspiration from what they did with the Monk in that? GP: So it's no relation at all? Kevin Martens: No, the monk is much more inspired by... - it's a pretty disparate group of influences, but for example on the gameplay side a pen-and-paper monk from D&D (Dungeons & Dragons), it's kinda like that for the early inspiration. And obviously kung fu movies, Jackie Chan all that sort of stuff, Once Upon a Time in China, many, many things from there. He's a got a bit of that Eastern European monastic thing, as far as cultural development goes. There's the fighting game mechanic, his combo system. So the way we try to do it is we take something that's archetypal - in this case, a fast but weaker melee character - but we try to put twists on it, with the culture, with the moves, with every aspect of this we can, we try to give it something fresh and interesting. So if we're going to introduce a new class, you know, it's not just the "assassin" by another name, it has some similarities to that but there's enough different about it that he not only plays differently but he feels different, and looks and fits into the world differently as well. We have't met anyone from his part of the world in the game before, so he's actually expanding the universe and the story as well. However they announce the Monk... He’s from Diablo Hellfire, while technically not a Diablo 2 character (and I think Hellfire was someone else’s project) hes still known in the Diablo universe. So why did blizzard tell us no more old classes then throw us a curve ball in the Monk? Bashiok: It’s not a recognized part of the Diablo franchise, and to be honest it is so much so not recognized, that when people asked about returning classes in the Q&A’s and in some of the press interviews the Hellfire expansion just wasn’t in anyone’s minds. Plus, it isn’t the same class. We aren’t taking an old class and updating it. The monk from Hellfire, and in fact the story and content of Hellfire, doesn’t exist as far as game lore and story is concerned going into Diablo III. They happen to share a name, the same as all of the other monk classes that have existed in all other RPG’s since the beginning of time. It doesn’t mean they’re related kit/story/flavor wise. The monks symbol is the mitsudomoe, a triple tomoe. It's used in family crests but also associated with Okinawa where many martial arts originated. View Monk video build guides and walkthroughs. 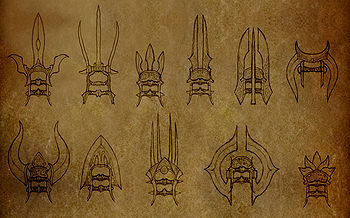 You can find every sort of Diablo III screenshot and artwork in the picture gallery. Monk using Seven Sided Strike. A bubble of his own: Impenetrable Defense. Concept art for a battle-ready Monk. This page was last edited on 21 November 2013, at 19:10.